Comments Off on 20th Anniversary Poetry Gala! Time flies when you’re building community, especially in a community as wonderful as Portsmouth. 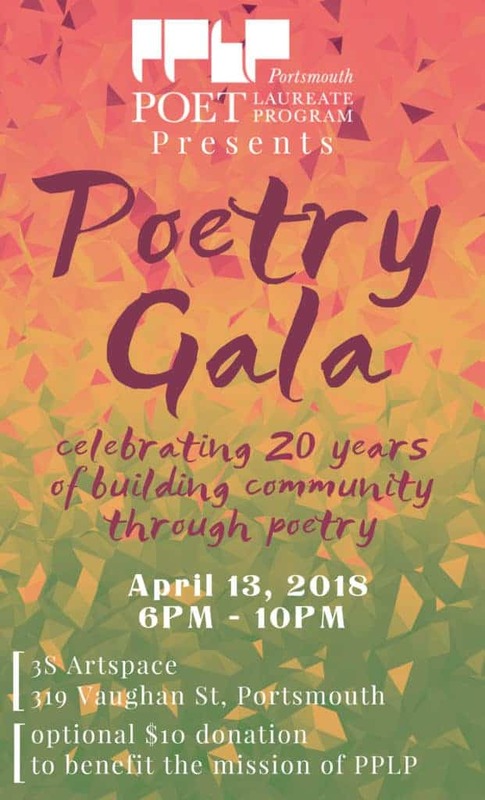 We hope you will join is in celebrating with an evening of poetry, music, prizes and dancing to mark the 20-year anniversary of the Portsmouth Poet Laureate Program (PPLP) April 13 at 3S ArtSpace. The event, emceed by current Portsmouth Poet Laureate Mike Nelson, will feature readings by many of PPLP’s past laureates and New Hampshire Poet Laureate Alice Fogel, as well as poetry activities, raffle drawings and hors d’oeuvres with a cash bar. The evening will conclude with a live-music dance party. “We really see this as an opportunity for the whole Portsmouth and Seacoast arts community to get together and celebrate, and we hope to see many of our friends from other local arts organizations come and enjoy food, drink and camaraderie,” said Marina Buckler, co-chair of the PPLP Board of Trustees. Portsmouth resident Nancy Moore Hill and a group of poets and friends founded PPLP–as the organization is commonly known–in 1998, with a mission to build community through poetry. Every two years, the group appoints a new Portsmouth Poet Laureate who receives a stipend and support for a new, community-building project. “PPLP is one of the oldest municipal laureate programs in the country that actually provides a stipend and support for the laureate,” said Bill Burtis, co-chair of the PPLP Board of Trustees. Music and hors d’oeuvres start at 6 p.m., with poetry and performances starting at 7. In addition to raffle prizes, silent auctions will be held for rare poetry books signed by the authors. Reserve your spot at the Gala through the event page.